Michel Roth has become a symbol of the best French culinary tradition, embodying the obstinacy and perfectionism of a chef who chose his trade to “make others happy”. Originally from the Moselle, he started his apprenticeship at the Auberge de la Charrue d’Or at Sarguemines before continuing on a path that would take him to the very best restaurants; the Crocodile, the Auberge de L’ill, Ledoyen, etc. He then joined the Ritz in 1981, under the management of Guy Legay, and stayed there 19 years, climbing the ranks to the top. After a spell at Lasserre, the Ritz asked him to take over the management of its kitchens in 2001, an offer he couldn’t refuse. Michel Roth travels the world in the company of other prestigious chefs. He represents a refined, creative, tasty and colourful form of French cuisine. Last of all, one can only be impressed by the long list of competitions he has won over the years: Prix Taittinger, Prix Escoffier and so on, and above all the Meilleur Ouvrier de France award in 1991. 2009 (the year of his 50th birthday) was a marvellous year for him: in January, he was elected Chairman of the Bocuse d’Or Winners’ Academy, and in March he was awarded a second star by the Michelin Guide. When the Ritz closed for a two-year period due to construction, it gave him a break, but certainly not a relaxing one. Solicited right, left and centre, he opted among others for the post of Consultant Chef at the President Wilson Hotel in Geneva and was quick to win them a Michelin star and an 18-point score from the Gault Millau. 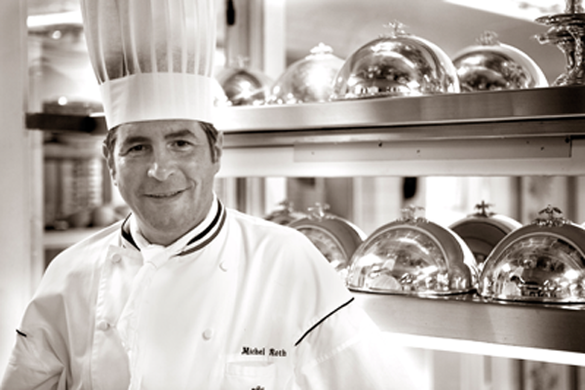 Michel really enjoyed working on a variety of projects and decided not to return to the Ritz kitchens (although he remains their loyal ambassador).He is now pursuing his mission in Geneva, while also working as a consultant on a multitude of projects (putting his name to airline dishes for Servair, for example).